Contact a French Sales Engineer for more information about our custom industrial hydraulic press molding solutions for industrial applications. This clamshell industrial hydraulic press design allows the lower platen to shuttle out, while the upper platen extends out and tilts upward. This arrangement provides easy access to the mold tooling for material loading and part removal. The result is more consistent dimensional part characteristics by providing uniform heating and pressure across the mold. This design is also provides good ergonomics by eliminating any lifting of the mold by the operator, simplifying press cleaning. French hydraulic presses are designed with a number of special features designed to increase press dependability and reduce the Total Life Cycle Costs, in turn improving overall profitability. Heated platen designs help provide uniform heating across the mold. Low deflection designs yield accurate, uniform parts that require little or no post handling, and very low scrap rates. Heavy-duty construction guarantees years of reliable service with minimal downtime. 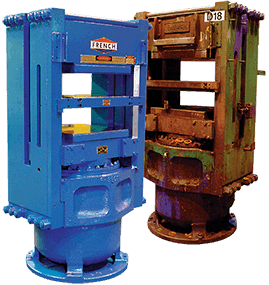 French combines a rugged patented taper key sideplate hydraulic press design, with highly dependable and efficient electrical and hydraulic systems. Many of the design features not only extend the life of the press, but also produce more consistent and higher quality parts at higher cycle rates. They contribute to the lowering of production costs by reducing scrap rate, flash and post handling requirements while using less operating energy. 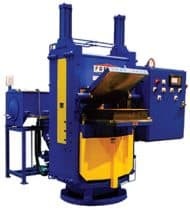 This long stroke hydraulic press system is specifically designed for the compaction molding of granular and powdered materials such as Teflon and fluoroelastomers. Integrated with this press system is a precision position control package to improve the accuracy and parameter control. Pressure, speed and position can be greatly improved to levels that are near to servo valve technology. The results are substantial production flexibility, optimization and very consistent part quality. Many customers have been able to reduce the scrap rates that exceeded 25% to nearly zero because of the specialized compaction control.